In the today’s hyper-connected world, a website is not just a reflection of your business, but also an integral part, and the most happening place of your business. If you are a realtor, it’s no less than your sales office. Like a salesperson, it should talk to the prospects, showcase what’s available, tell them about the purchase estimate and help them with other information. Are you expecting your real estate website development company to transform your digital platform into a sales office? Indeed, it’s difficult, but not impossible. Here are top 5 things that you must include in your website. In the quest for beauty, let your web designer doesn’t forget the fundamental principle of a user journey. Let users navigate to the right options and the correct information effortlessly across any device. A good deal of efforts is required in making the design responsive. Hence, you must have a competent real estate web developer. It has been estimated by The National Association of Realtors and Google that a user makes nine searches before any taking action on a real estate website. It conveys the challenges undertaken by the digital marketer in their attempt at bringing traffic to a website. On the digital platform, what can be more engaging than a video? Unlike other realtors who offer photos of the images to showcase houses and apartments, go for video streaming. Reveal the interior and exterior of the building with a high-resolution video. It will significantly transform the user engagement and conversion rate. A joint study by the National Association of Realtors and Google reveals that 51% homebuyers watch videos on YouTube or other sites to conclude their purchase decision. Here comes the role of your real estate web developer? Ask him or her to make use of a robust technology framework that can handle videos of any resolution and format. The video must work with all favorite media players across targeted devices, including PC, Mac, Smartphone, iOS, Windows Phone, etc. Go beyond the contact number and emails. The dominance of app-based conversational culture is not hidden to anybody. A smartphone is no longer a phone alone. Customers are more addicted to messaging and chatting apps they own on their phone. According to an ATG study, 90% of homebuyers contact a real estate agent with chat option available on his or her website. Hence, equip your real estate website with a chat tool. However, for that, you need to employ people to manage and monitor the query that users raise. So, this comes at a recurring cost. The better option would be to go with an AI chatbot. However, it must be programmed well to respond to the user’s queries based on a contextual understanding of what they text to you. So, the chatbot helps you stay responsive and cut down the operational cost. Prospects looking for a home will also be interested in knowing their affordability. Hence, it’s a wise decision to include a calculator that can help them perform different calculation like finding area, calculating mortgage EMI, or conducting other calculations. The better estimation will help them to make a better move. Integrate your website with a compatible user analytics tool so that you can be in the know of the website traffic, engagement, user’s action, and conversion. The tool can also help you to identify bottlenecks with metrics like bounce rate, high CTC (Click-through-Rate), etc. 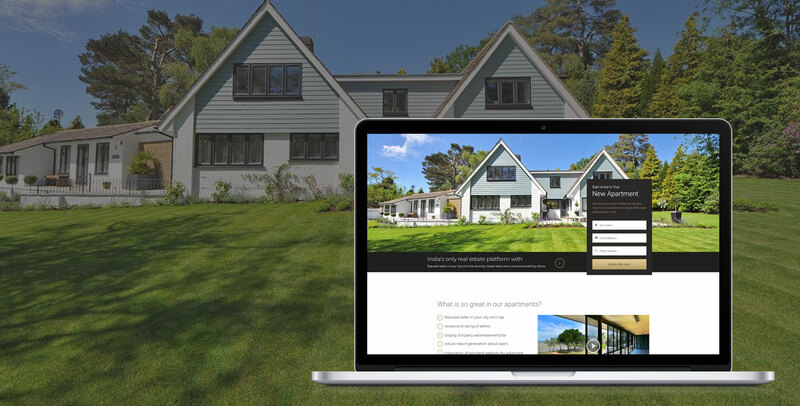 Thus, you can ask your real estate website development company to take constructive actions. Now that you have included great features on your website, it doesn't mean you should stop. The web is an emerging world, and there is no saturation point. Hence, keep monitoring what users expect from your website and take the right call at the right time.